So, no one died. 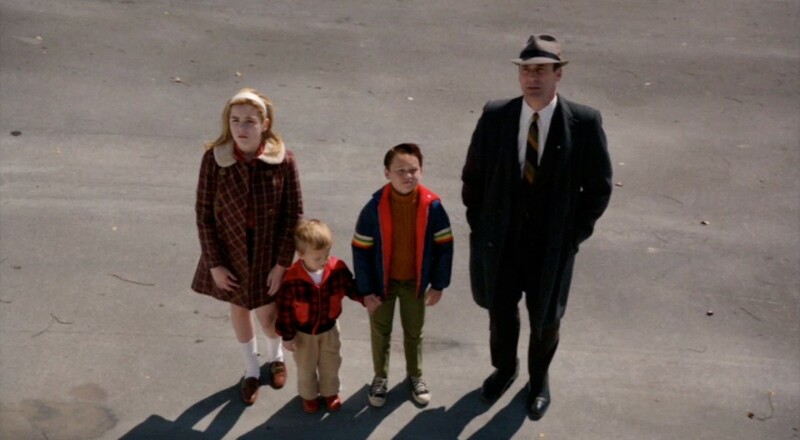 I just watched the Mad Men season 6 finale and I just have a few thoughts. There wasn’t much in the finale regarding Sally and Don, but what there was was pretty significant. Let’s not forget, also, that the title of the finale, “In Care Of” references the letters getting sent to Sally via Don asking for her statement about the break-in. So the idea that Sally is in Don’s care runs through the entire episode. Aside from the letters, Betty calls Don upset that Sally has been suspended. On the heels of Don’s bender and night in jail, he finds out that his daughter got caught buying beer under a fake name and getting other girls at boarding school drunk. Like father, like daughter? Don is no stranger to the notion that people use alcohol to run away from problems, but he’s so caught up in his own stuff he doesn’t react much to the news. Betty, however, is upset by how little her parenting seems to help. For once we see her vulnerable, worried that she doesn’t have enough to give Sally. The relationship between Sally and Betty has started to evolve again in Season 6, as we saw last week with the cigarettes. Will the bad outweigh the good, like Betty says, or are there better days ahead, I wonder? Then, there’s that Hershey’s pitch. The whole fiasco was weird. As an audience, it was pretty obvious that the story about associating a Hershey’s bar with a father’s affection was bogus coming from Don. By this point we know that he had a miserable childhood. Given the events this season between Sally and Don, however, and the “In Care Of” thread, there seems to be another valence. The whole notion of a father’s genuine affection at this moment seems pretty bogus. Sally doesn’t think she knows her father at all and actively pushes him away, realizing that he hasn’t been honest or really present (remember: “My father’s never given me anything”?). Not only did Don not have that ideal father, he really hasn’t been one either. To me, the pitch harkened back to that ad for Kodak Carousel he did (embedded below), waxing nostalgic about the family life that was starting to fall apart, yet spinning a fiction of childlike perfection instead. Don’s breakdown in the meeting, telling the true story about his experience with Hershey Bars in the brothel he grew up in and his subsequent ousting by the partners builds toward the end of the episode and the significant look between Don and Sally. After picking up his sons and fetching Sally from boarding school, Don takes them on a drive. They’re confused when he wants to get out in a rough party of town (Hershey, PA?) and then he announces, “that’s where I grew up.” Gesturing toward a run-down Victorian house, which looks abandoned except for a little black boy eating a Popsicle. It looks like lights go on in Sally’s head and she gives Don a glance that seems part understanding and part disgusted, as though she’s starting to understand why she knows so little about her father. I’m not gonna talk about the coming season, because I don’t really know. But I can tell you that I hope the audience can take that for what it is: a mammoth moment in both of their lives. Sally seeing Don with Sylvia is the worst thing that ever happened to him, as far as I’m concerned. The shame — for both of them, for Sally and Don — has been devastating… I’m not being coy, but I hope the audience gives that moment its due. At any rate, Season Six was certainly a shakeup for Mad Men and I am curious to see how Don’s downward spiral, Peggy’s frustration, Megan’s departure, Sally’s realizations, and Betty’s rebirth factor into next year’s stories. What did you think of Mad Men this season?